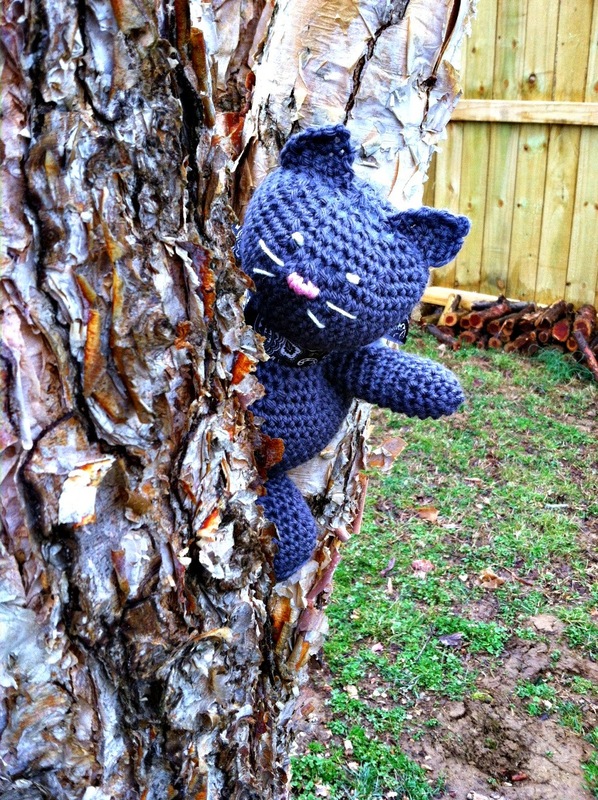 Free Pattern - Jenny the Crocheted Cat - love. life. yarn. 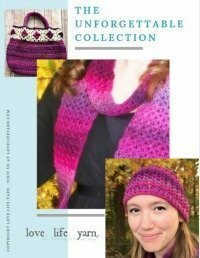 It is such an honor to be on the Crochetville National Crochet Month Designer Blog Tour! I wanted to design something new that I haven’t done before and decided upon a stuffed animal. 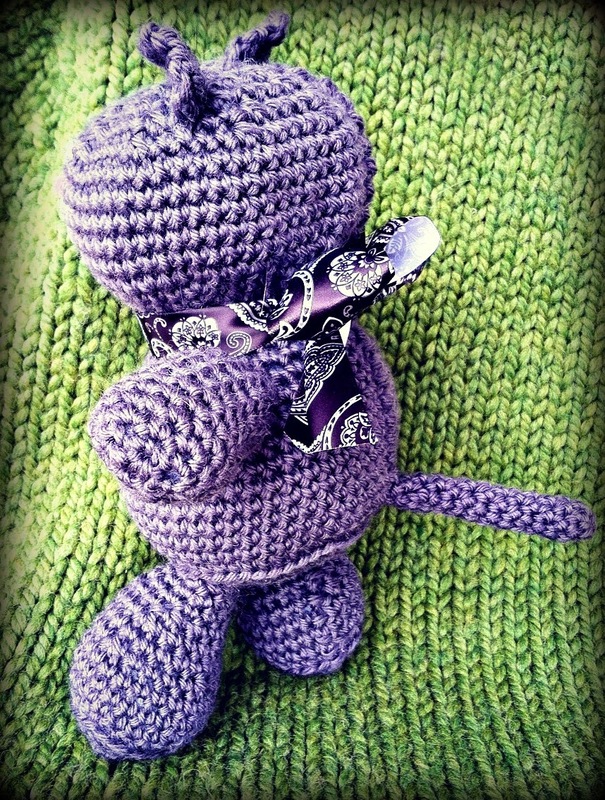 At first I had a bear in mind, but once she was almost finished I just had to make her a cat instead! When I was a child I always thought of my stuffed animals as a he or a she and my first animal design is no different. I didn’t think about it until I got out the pink yarn for the nose and immediately it was a “she”, even though we have two male cats with pink noses. I am definitely thinking “he” and “she” lately as we are finding out next week if our third child will be a boy or a girl! I hope you enjoy this pattern. It was such a pleasure to make. Head over to my Patterns section to check out other free patterns I have designed. Thanks for visiting! Round 2: Ch 1, 2 sc in each sc around – 8 sts. Round 3: Ch 1, *sc, 2 sc in next st; repeat from * – 12 sts. Round 4: Ch 1, *sc 2, 2 sc in next st; repeat from * – 16 sts. Round 5: Ch 1, *sc 3, 2 sc in next st; repeat from * – 20 sts. Round 6: Ch 1, *sc 4, 2 sc in next st; repeat from * – 24 sts. Rounds 7-8: Work even in sc. Round 9: Ch 1, *sc 4, sc2tog; repeat from * – 20 sts. Round 10: Work even in sc. Round 11: Ch 1, *sc 3, sc2tog; repeat from * – 16 sts. Round 12: Ch 1, *sc 2, sc2tog; repeat from * – 12 sts. Rounds 13-15: Work even in sc. Fasten off. Round 1: 3 sc in 2nd ch from hook, sc in next ch, 3 sc in last ch, sc in opposite side of chain – 8 sts. Round 2: Ch 1, 2 sc in first 3 sts, sc, 2 sc in next 3 sts, sc – 14 sts. Rounds 3-8: Work even in sc. Round 9: Ch 1, sc2tog, sc 6, sc2tog, sc 4 – 12 sts. Round 10: Ch 1, *sc, sc2tog; repeat from * – 8 sts. Round 11: Work even in sc. Round 1: 4 sc in 2nd ch from hook, sc in next 2 ch, 4 sc in last ch, sc 2 in opposite side of chain – 12 sts. Round 2: Ch 1, 2 sc in first 4 sts, sc 2, 2 sc in next 4 sts, sc 2 – 20 sts. Round 3: Ch 1, *sc, 2 sc in next st; repeat from * three times, sc 2, repeat from * four times, sc 2 – 28 sts. Round 4: Ch 1, *sc 2, 2 sc in next st; repeat from * three times, sc 2, repeat from * four times, sc 2 – 36 sts. Round 5: Ch 1, *sc 3, 2 sc in next st; repeat from * three times, sc 2, repeat from * four times, sc 2 – 44 sts. Round 6: Ch 1, *sc 4, 2 sc in next st; repeat from * three times, sc 2, repeat from * four times, sc 2 – 52 sts. Round 7: Ch 1, sc back loop only in each st around. Rounds 8-14: Work even in sc. Round 15: Ch 1, *sc 4, sc2tog; repeat from * three times, sc 2, repeat from * four times, sc 2 – 44 sts. Round 16: Ch 1, *sc 3, sc2tog; repeat from * three times, sc 2, repeat from * four times, sc 2 – 36 sts. Round 17: Ch 1, *sc 2, sc2tog; repeat from * three times, sc 2, repeat from * four times, sc 2 – 28 sts. Rounds 18-21: Work even in sc. Round 22: Sl st 2, ch 1, *sc 2, 2 sc in next st; repeat from * three times, sc 2, repeat from * four times, sc 2 – 36 sts. Round 23: Ch 1, *sc 3, 2 sc in next st; repeat from * three times, sc 2, repeat from * four times, sc 2 – 44 sts. Round 24: Ch 1, *sc 4, 2 sc in next st; repeat from * three times, sc 2, repeat from * four times, sc 2 – 52 sts. Round 25: Work even in sc. Round 26: Ch 1, sc 24, 2 sc in next st, sc 4, 2 sc in next st, sc 22 – 54 sts. Round 27: Ch 1, sc 24, 2 sc in next st, sc 6, 2 sc in next st, sc 22 – 56 sts. Round 28: Ch 1, sc 24, 2 sc in next st, sc 8, 2 sc in next st, sc 22 – 58 sts. Round 29: Ch 1, sc 24, sc2tog 6 times, sc 22 – 52 sts. Round 30: Sl st 2, ch 1, *sc 4, sc2tog; repeat from * three times, sc 2, repeat from * four times, sc 2 – 44 sts. Round 31: Ch 1, *sc 3, sc2tog; repeat from * three times, sc 2, repeat from * four times, sc 2 – 36 sts. Round 32: Ch 1, *sc 2, sc2tog; repeat from * three times, sc 2, repeat from * four times, sc 2 – 28 sts. Round 33: Ch 1, *sc2tog around – 14 sts. Round 34: Ch 1, sc2tog around – 7 sts. Row 2: Ch 1, sc2tog, sc 2, sc2tog; turn – 4 sts. Row 3: Ch 1, sc, sc2tog, sc; turn – 3 sts. Row 4: Ch 1, sc3tog – 1 st. Fasten off. Rounds 2-21: Work even in sc. Fasten off. Stuff arms, legs and tail (if desired). Sew ears to top of head and attach arms, legs and tail. Use scrap yarn to embroider face and any other details as desired. Very cute! Love your Jetsetter Sweater, too! Thanks! Congratulations on your upcoming addition! So happy for you! I a very confused by your pattern. For the body, what do you mean by 2 sc? Are they attached to the previous row? And why do you do a slip stitch at the end of every row? 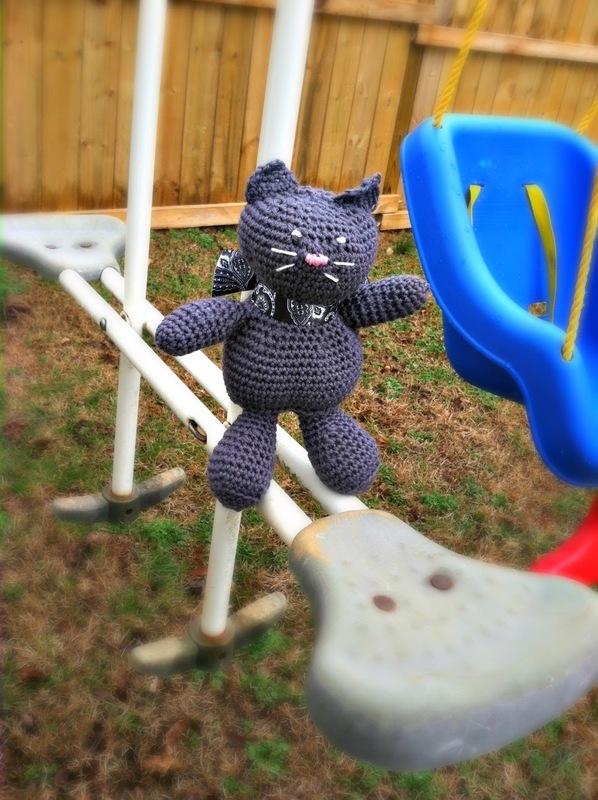 Trying to make this for my boyfriend’s little niece. Where it says 2 sc you would do 2 single crochet in the same stitch (so if you see “2 sc in first 4 sts” you end up with 8 sts – it is how you increase the size). I found a video showing how to do this. As for the slip stitch, it is possible to create a stuffed animal doing what is called a spiral (where you don’t join with a sl st). This article explains the difference well.